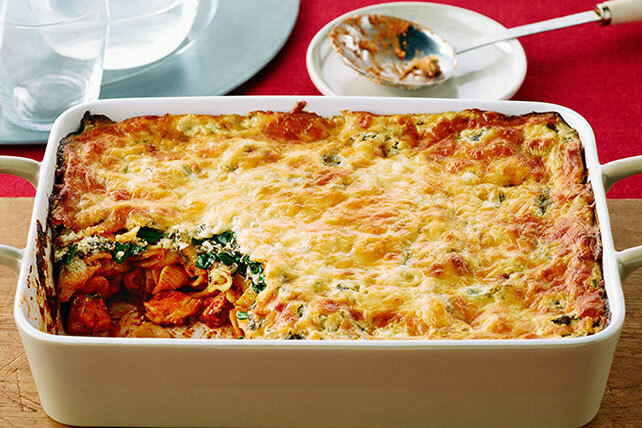 Enjoy the glorious cheesiness of pasta shells stuffed with chicken Florentine without the hassle of, well, stuffing the shells. Cook pasta as directed on package, omitting salt. Meanwhile, cook chicken in large nonstick skillet on medium-high heat 5 to 6 min. or until no longer pink, stirring frequently. Stir in pasta sauce. Spoon into 13x9-inch baking dish sprayed with cooking spray. Drain pasta; spoon over sauce. Mix cream cheese spread, milk, Italian seasoning and garlic powder in medium bowl until blended. Add spinach; mix well. Spoon over pasta. Top with cheeses; cover. Bake 45 min., uncovering for the last 10 min. Let stand 5 min. before topping with basil and serving. This flavorful recipe can be prepared ahead of time. Assemble as directed; cover with foil. Refrigerate up to 24 hours. When ready to serve, bake (covered) in 400ºF oven 1 hour to 1 hour 10 min. or until heated through. Let stand 5 min. before topping with basil and serving.